The greatest thing about frozen yogurt is definitely the way two flavors can be swirled together. While it doesn't really make a difference in taste, that perfectly integrated look makes it just better somehow. Well, hold on to your hats, because now you can bring that swirled magic to your homemade cupcakes. Sure, there are many different options for frosting the tops of these little cakes. A quick look at Martha Stewart can leave your head spinning with ideas. But if you don't have a ton of time, or a lot of confidence in your ability with frosting, this decorating hack will not only give your cupcakes a professional look, but is also incredibly simple -- anyone can do it. Our Best Bites, a food blog, introduced us to this idea. With just a couple of extra piping bags, they make swirled frosting a breeze. To make these beautiful swirls you'll need two different colored icings (or more, as many as you can handle really), separate disposable piping bags for each frosting (plus one extra), and a large decorating tip. Fill up the bags no more than half way if using two frostings and a little less if using more. Flatten the bags as pictured above and stack one on top of the other. 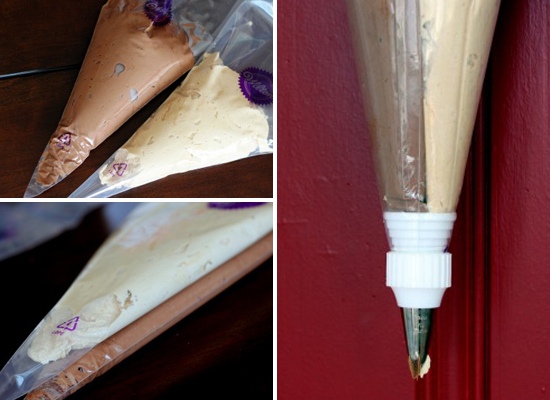 Place the individual frosting bags in one piping bag fitted with the decorating tip. Squeeze the bag until you have equal parts of all the frostings and then swirl magic is your to make. For more detailed instructions, visit Our Best Bites tutorial. Now, get frosting! Want to try the hack? Use it on these recipes.